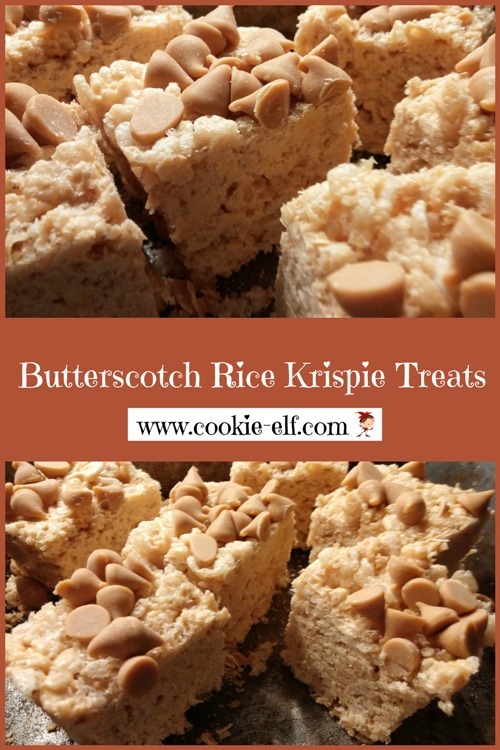 Butterscotch Rice Krispie Treats are an easy variation the classic no-bake cookie recipe. Original Rice Krispies Treats are made with crisp rice cereal, marshmallows, and melted butter. This version includes butterscotch chips – one part melted into the cookie mixture and one part sprinkled on top. It is an easy cookie recipe is perfect for kids to make. As an added bonus, the bars are a gluten-free cookie! You can find butterscotch chips (or butterscotch morsels) in your grocery’s baking aisle, near the chocolate chips. Line a 13 x 9 baking pan with foil, allowing the ends of the foil to drape over the ends of the pan. Spray the foil lightly with cooking spray. Sprinkle ¾ cup (about half the bag) of butterscotch chips on the bottom of the pan. Set aside. Set butter, marshmallows, and remaining butterscotch chips in a large, microwave-safe bowl. Microwave on high for 1 minute. Remove the bowl from the oven and stir. Return bowl to the oven. Microwave in 30-second increments, removing the bowl and stirring the marshmallow mixture each time until it is smooth. While marshmallow mixture is cooking in the microwave, measure rice cereal into a mixing bowl. When the marshmallow mixture is ready, pour it into the rice cereal. Stir quickly, mixing thoroughly to coat the cereal. With a spatula or wet fingers, press cereal mixture in the prepared baking pan over top of butterscotch chips. Chill cookies in the refrigerator 15-30 minutes or longer. Place a cutting board across the top of the baking pan. Flip pan over. Peel back the foil. The butterscotch chips will now be on top of the treats. Store bars in an airtight container with waxed paper in between layers. You can substitute 10 ounces of miniature marshmallows or 1 jar (7 ounces) of marshmallow crème for regular marshmallows. If you do not wish to use the microwave, you can melt butter and marshmallows in a large saucepan on the stove top at low heat, stirring continually, until ingredients are melted and smooth. See more Rice Krispie Treats on The Cookie Elf's Rice Krispie Treat Variations Pinterest board.